500 years ago, on 31st October 1517, Martin Luther nailed his famous 95 theses to the door of All Saints’ Church (known as the Castle Church) in Wittenberg; this became known as the start of the Reformation. 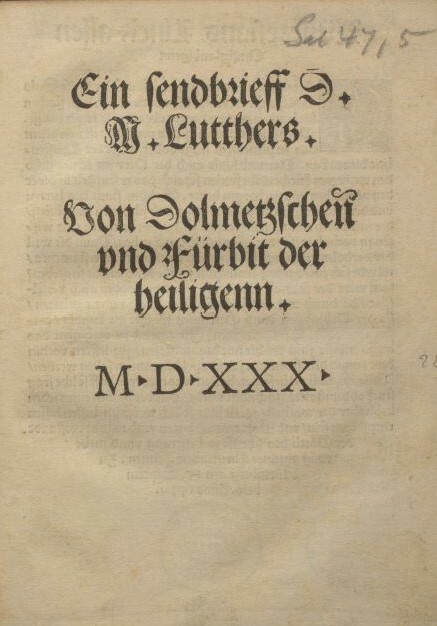 Not many years later, in 1522, Luther finished his Bible translation into German, thus making the Bible accessible to people who did not know Latin. They could now read the Bible for themselves, and were no longer solely dependent on explanations and interpretations given by priests. 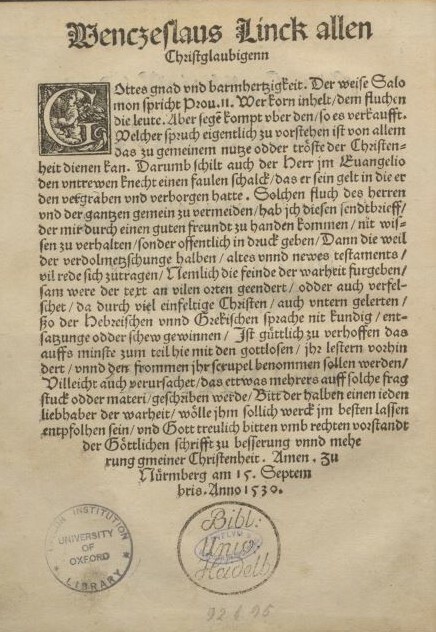 Not only was this Bible translation hugely important in the breakthrough of the Reformation; it also was the deciding factor in determining the main language used in Germany. Since Luther wrote in his own High German dialect, this – rather than Low German – became the main language of Germany. 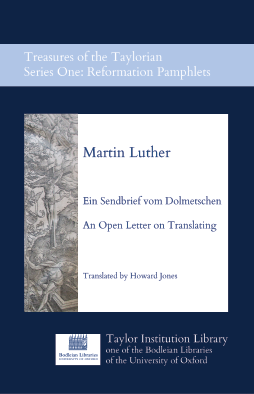 Luther explained his ideas about sense-for-sense translating of the Bible in an Open Letter, Sendbrief vom Dolmetschen (Open Letter on Translating). This Sendbrief or Open Letter is one of the Luther pamphlets the Taylorian is fortunate to hold. These pamphlets were acquired from several University Libraries, notably Heidelberg, in 1878. The Sendbrief was chosen for re-publication on the occasion of the 500th anniversary of the Reformation. Subsequently, it has been published online, and including a translation into English, and can be freely downloaded from http://www.bodleian.ox.ac.uk/taylor/about/exhibitions-and-publications (print copies for sale in the library). Howard Jones translated the text into English, Henrike Lähnemann wrote the introduction and Emma Huber (German Librarian) prepared the digital publication. The Sendbrief was read out in full on 25th May 2017 at the Taylor Institution by over 30 readers who read one or two paragraphs each. This reading event brought the text to life in a new way. The entire event is available on video from http://podcasts.ox.ac.uk/sendbrief-vom-dolmetschen. As an author, Luther came across as a witty person who knew how to engage with his audience of ordinary people. He criticised his opponents for being ‘Esel’ (donkeys), not clever enough to understand that the real purpose of the Bible was to be read by all, whether educated or not. Luther’s thoughts about translation also became clear to me when I heard the letter read aloud. His thoughts on how to translate in such a manner that the ordinary person could understand the text can be regarded as an early example of translation theory. One of Luther’s arguments against literal translation was illustrated by the angel’s greeting to Mary ‘Hail Mary, full of grace, the Lord be with you’. Luther goes on to say ‘Tell me, is this good German? Show me any German who says, ‘You are full of grace’. For that matter, what German will understand the meaning of ‘full of grace’? They’re going to think of a barrel full of beer or a bag full of money. That’s why I rendered it into German as ‘gracious one’, to make it easier for a German to actually work out what the angel means by his greeting.’ Luther’s concern was that the language of the Bible should not be a barrier to understanding for those listening to it read aloud, or reading it themselves. The facsimile and transcription can be found on https://blogs.bodleian.ox.ac.uk/taylor-reformation/digital-library/ein-sendbrief-vom-dolmetschen/. Martin Luther, translated by Howard Jones (2017) Ein Sendbrief vom Dolmetschen = An open letter on translating. Treasures of the Taylorian. Series one. Reformation pamphlets. Oxford : Taylor Institution Library. This entry was posted in Special Collections and tagged Martin Luther, Reformation, translation on 31 October 2017 by ferrarij.